A multi-talented artist, scholar, educator, and curator, Howardena Pindell was born in Philadelphia in 1943 to middle-class parents who nurtured their only child’s intellectual pursuits. A northern city, Philadelphia was nevertheless segregated, and Pindell has recalled the sense of danger she felt crossing into white neighborhoods even as a child. [ii] Although she was interested in sciences and also studied ballet and music, Pindell demonstrated a particular aptitude for art at a young age, and when she was in third grade her parents enrolled her in Saturday art classes at the suggestion of her teacher. Pindell continued to study art through high school, taking classes at Temple University’s Tyler School of Art until she graduated and left to pursue a BFA at the Boston University School of Fine and Applied Arts. After receiving her BFA in 1965, Pindell went on for graduate study and earned her MFA from Yale University’s School of Art and Architecture in 1967. Pindell moved to New York after graduate school and got a job working in the International and National Circulating Exhibitions Department at the Museum of Modern Art (MoMA). The job consisted primarily of registrarial tasks, so Pindell spent most of her time looking closely at individual works of art. When the museum was reorganized two years later and her department eliminated, she ended up working as an associate curator of prints and illustrated books. Pindell’s job at MoMA occupied most of her day, which meant that she was unable to work on her own art during daylight hours and instead had to rely on artificial light when painting. This lack of natural light led Pindell to experiment with color as well as form, and in the early 1970s, she started to move away from her training in figural representation towards works organized around dots and grids. Punching holes in paper and board, Pindell created stencils that she then used to spray paint forms onto canvas. Over time, “the punched holes accumulated, and she ended up with bags of tiny dots.”[iii] She then began to use these dots as a way to add sculptural elements to two-dimensional works; they “became studies in accumulation of color, space, and surface texture . . . But underneath the seemingly random surfaces, was always the grid that reflected her thoughts about a technological society.”[iv] Around this time, Pindell also began cutting down the size of her canvases and sewing the scraps together to make soft sculpture. As a woman of color working in abstraction, Pindell confounded the categories of an art world that saw abstraction as the purview of white men, and she had a hard time finding venues to exhibit her work. In 1972, she became a founding member of AIR Galleries, a feminist collective that provided an exhibition venue in SoHo for women artists. But she left in 1982 out of a growing sense of disillusionment with a woman’s movement that constructed “woman” in primarily white and middle class terms. In 1980, Pindell created Free White and 21, a video piece in which she cut between shots of herself recounting experiences with institutional and personal racism and shots of herself in a blonde wig, white make-up, and sunglasses. At various points in the video, the white character dismisses Pindell’s perspective, calling her paranoid and accusing her of being ungrateful. The video dramatizes the failure of second wave feminism to account for multiple forms of oppression and how this failure led the movement to reproduce the structures of oppression it sought to dismantle. Its title references a recurring phrase in late nineteenth and twentieth century American popular culture usually uttered by a young, white, female character as an assertion of her right to do as she pleases within the limits of the law: “I’m free, white, and over twenty-one.” Although Pindell had trouble showing the work in the 1980s, it has since been recognized as a groundbreaking moment in the history of video art. Pindell has continued to develop and transform her approaches to art, weaving together personal and cultural history, trauma, and recovery, and remaining an outspoken champion of social justice. In her accomplished career, she has been a visiting professor at Yale (1995-1999), directed the MFA program at SUNY Stony Brook (2003-2006), and collaborated with the Brandywine Workshop on a series of prints. Pindell has also been the recipient of grants and awards from such institutions as the Guggenheim Foundation (1987), National Endowment for the Arts (1972 and 1984), College Art Association (1990), Joan Mitchell Foundation (1994), and Studio Museum in Harlem (1994). Her work appears in permanent collections nationwide, including the Whitney Museum of American Art, MoMA, and the Metropolitan Museum of Art (all in New York) as well as the Fogg Art Museum of Harvard University and the Yale University Art Museum. [i] Howardena Pindell, quoted in Jessie L. Whitehead, “Theorizing Experience: Four Women Artists of Color,” Studies in Art Education, 50:1 (Fall 2008), 30. [iii] Phoebe Farris, Women Artists of Color. 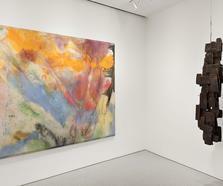 [v] “Howardena Pindell,” Lana Woods Gallery. http://www.lanawoodsgallery.com/HPindell.html (accessed February 2014). [vi] Elizabeth Alexander, Power and Possibility: Essays, Reviews, and Interviews (University of Michigan Press, 2007), 115.